Westchester Community College students have a responsibility to uphold and build upon the values of the college community. The Student Code of Conduct is the document that details these values and student responsibilities. The College looks to students to breathe life into this code by engaging in activities that promote individual growth, demonstrate civility toward others, and builds community through the safe, respectful exchange of diverse thought, opinion, and action while on campus and in everyday events. To maintain the trust extended by the College, students are expected to be exhibit personal accountability and remember that the decisions they make have an impact on the overall health of our community, and, ultimately, on the quality of their experience. Students who breach this trust and engage in activities that are counter to the community’s values will be held accountable. The Student Code of Conduct establishes a fair and transparent process for the adjudication of alleged violations. The Student Code of Conduct seeks to be educational, not punitive, in nature while also ensuring that the interest and well being of the greater college community and its members are protected. 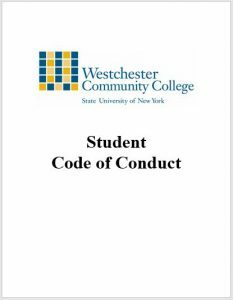 It is essential student are familiar with the Student Code of Conduct and refer to it throughout their career at Westchester Community College.